I was in Cairo during the Arab uprising, my hostel was 2 blocks from Tahrir Square where in the first night of protest, police shot dead close to 30 protesters. There were 10's and thousands of Egyptians protesting. I was not going to let anything stopping me from sightseeing in Egypt. The uprising in Egypt turned out in my favor as most tourist had left and imagine being alone in the great Pyramids of Giza. A boat trip down the Nile river. My Hostel had arranged a Cab for me to Visit the above places, for someone coming from the USA I felt the cabs were cheap. I also took the cab for a day trip to Alexandria Egypt. Check out my post on Alexandria Egypt. Stay: I stayed in the Center of the City walking distance to the Nile river and the Cairo Museum.I was there during the Egyptian demonstrations and was the only one in My Hostel, most tourists had left. I did not have any problems in Egypt. My hostel was 10 US dollars a night. I arrived late in the evening and the next day I was off to see the Pyramids of Giza, I had waited for this day forever. Eats: For cheap healthy and cheap eats try The Koshary, there are several shops in Cairo that sell Koshary. For Non Vegetarians I recommend to checkout GAD, there are several of them in Egypt. Travelling during the Egyptian Protests, there were hardly any tourists. imagine being alone in desert with the Great Pyramids around you. Walking towards the Sphinx I did see a few French Tourists. After spending a good part of the day in Giza I went to see the The Pyramid of Djoser (Zoser), or step pyramid. I ended the day with a visit to Memphis, Egypt. Within the Museum in Memphis is a giant statue of the pharaoh Rameses II. There is an entrance fee to see just about any ancient historical sights in Egypt. 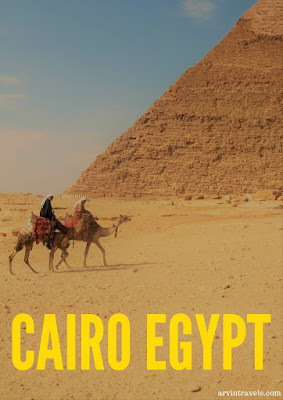 A trip to Egypt would not complete without a trip on the Nile river, I rented a felucca boat, below some Pictures I took while waking along the Nile, during my stay in Cairo, I walked along the Nile just about every night. Below the felucca driver, he knew how to work a Sail boat, he was real good. I was his only passenger, we did not communicate mush as I do not speak Arabic and he didn't speak any other language. In Cairo though you can get by with English for the most part. The boat ride costed me US$12. Above" There is a old bazaar called khan el khalili, I did spend a few hours walking and checking out the shops. khan el khalili reminded me of shops in Old Delhi, narrow streets, over crowded and dirty. Still had that old middle Eastern charm. Sat at a tea shop to people watch, and waited for a mummy to come to life, though mummy coming to life only happens in movies. The picture above is the Egyptian Museum - a must see, they have built a new one Since my visit. At the Egyptian Museum, there was the Mask of Tutankhamun's mummy, photography was not allowed, it was one of the most beautiful man made things I had seen, stood there looking at it for a while, the Workmanship, the craftsman ship was extraordinary. Recently I started watching Alexandria on the Oxus, the lapis stone - lapis lazuli, used to decorate the Tutankhamun's Mask came from Afghanistan, thousands of years ago. Alexandria on the Oxus is just one of the best TV travel series. What an incredible adventure!! I've seen photos recently showing the pyramids swarming with people so it is great to see that it is still possible to see it without too much hustle and bustle!